This luxurious villa is located 13 km from Heraklion Crete, in the picturesque coastal village Kato Gouves, one of the most popular resorts of Heraklion and of Crete generally, with a large beach, and many interesting sights. You will have the opportunity to combine all the above while staying at Villa Kato, since in a very short distance you will find the Crete Golf Club, the famous aquarium 'Creta aguarium', and 2 water parks (aqua splash and water city). 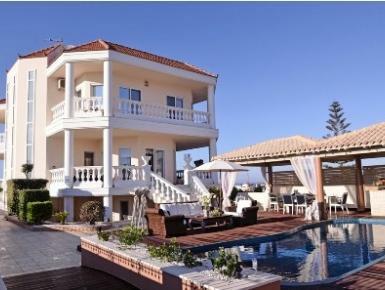 Rent the luxury Villa Kato and enjoy a pleasant and exciting accommodation with rich facilities. At a distance of approximately 50-100 meters, you will find cosy taverns and restaurants, where they serve traditional Cretan dishes. Try the traditional Cretan 'souvlaki' and be surprised how delicious it tastes. Enjoy your coffee directly by the seaside, since at only 50 meters there are trendy coffee shops and bars for your drinks and your nights out.